How would you like a chance to win a bicycle? May is National Bike Month, so Today Show is celebrating by giving away bikes to 10 lucky viewers. Don’t miss the chance enter the Kathie Lee and Hoda National Bike Month Giveaway now through June 7, 2018 for your chance to win one Firmstrong 1spduni18 bicycle and one Silk bicycle basket. How To Enter The KLG And Hoda Bike Giveaway? Enter this sweepstakes now through June 7 for your chance to win a bicycle. Who Can Enter: This sweepstakes is open only to permanent, legal United States (“U.S.”) residents who are physically residing in one (1) of the forty-eight (48) continental United States or the District of Columbia (excluding Alaska, Hawaii, Puerto Rico, Guam, the Virgin Islands and other United States territories), and who are eighteen (18) years of age or older as of the start of the giveaway period. 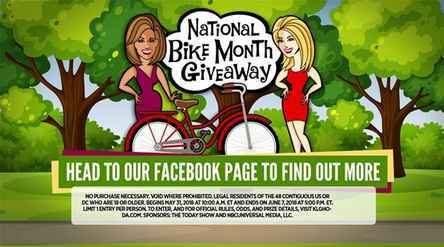 When To Enter: The KLG and Hoda National Bike Month Giveaway will begin on May 31, 2018 at 10:00 A.M. ET and end on June 7, 2018 at 5:00 P.M. ET. Sponsor: NBCUniversal Media, LLC and the Today Show (“TODAY”), both located at 30 Rockefeller Plaza, New York, NY 10112. Sweepstakes Prize: The Grand Prize Winner will receive the following (the “Grand Prize”): There will be ten (10) prizes awarded (“Prizes”, each a “Prize”), one (1) Prize to each Winner. Each Prize will consist of the following: one Firmstrong 1spduni18 bicycle and one Silk bicycle basket. Prize will be awarded “as is” with no warranty or guarantee, either express or implied by Sponsors. Prize may be subject to certain terms and conditions as specified by issuer.